This Oven Baked Pumpkin Gnocchi with Thyme and Parmesan is the perfect vegetarian one pot dish for casual entertaining. The sauce is rich and creamy and packed with wonderful fall flavours. The ultimate cheese and pasta bake dinner. 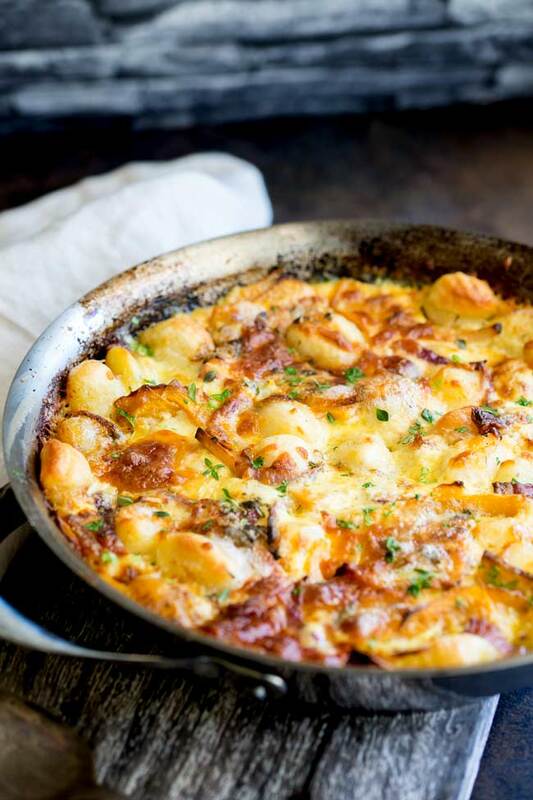 This baked pumpkin gnocchi is the epitome of comfort food! 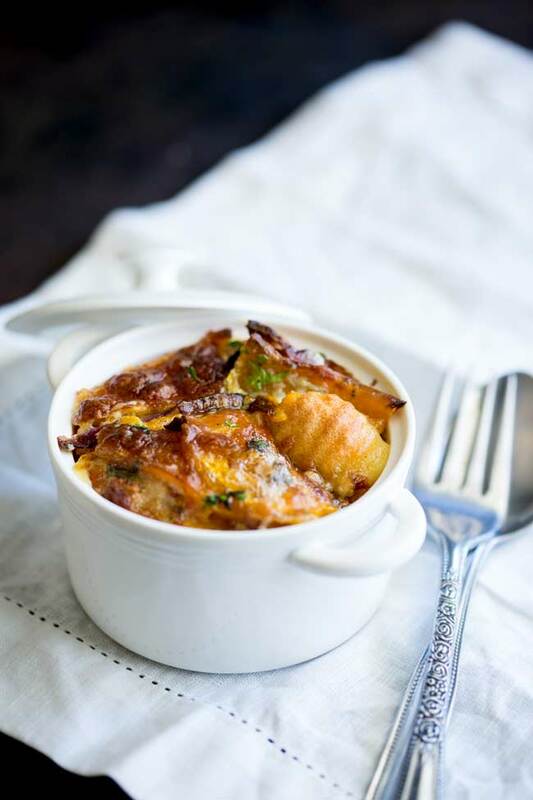 Pillow of potato gnocchi are baked with sliced pumpkin, onions, cheese and cream. The result is the most delicious pan of gnocchi ever. It makes the house smell like a big warm hug! 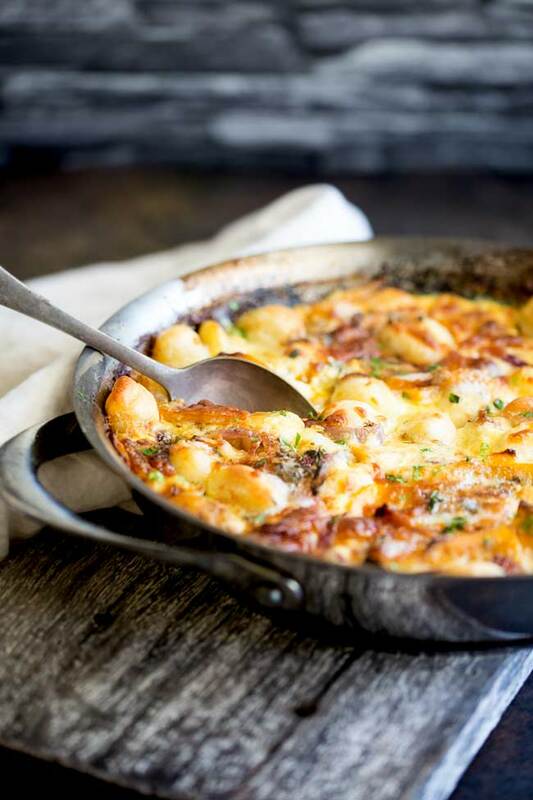 Honestly this might be my favourite gnocchi recipe ever!!!! 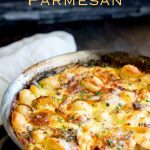 When it comes to comforting pasta dishes I think this Baked Pumpkin Gnocchi with Thyme and Parmesan hits the bulls eye. It is a crowd pleaser, and although the recipe takes 50 minutes, for 40 of those the dish is in the oven, so that gives you plenty of time to lay the table and make a quick side salad and an appetizer. Actually for a rich main dish like this I would suggest rather than a sit down appetizer, perhaps serve a light canapé instead. Something like my Seared Sesame Tuna Bites or just have some delicious olives and a glass of bubbly ready for your guests. I love these citrus herb marinated olives from Amanda, The Chunky Chef. Then finish the meal with a simple dessert like my Baileys Affogato 99. Simple and delicious! If you want to dress this dish up, you can bake it in individual dishes, like the picture above. Served like this it is a very elegant yet comforting dish. In smaller dishes like this check the pots after 30 minutes, if a knife goes through the pumpkin easily they are done. 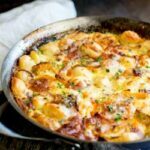 If you love this recipe for Baked Pumpkin Gnocchi with Thyme and Parmesan why not pin it for later. This Baked Pumpkin Gnocchi with Thyme and Parmesan is the perfect one pot dish for casual entertaining. It is rich and creamy and packed with wonderful fall flavours. Recipe from Sprinkles and Sprouts | Delicious food for easy entertaining. Grease a 13" round baking dish. Bring a large pan of water to the boil, salt it generously and add the gnocchi. Cook it as per the packet instructions and then drain and rinse in cold water. Peel and slice the onion into half moons. In a large bowl, mix the cooked gnocchi, sliced pumpkin, onion, olive oil and thyme. Whisk the cream together with the egg yolks and half of the mozzarella. Pour the mixture over the gnocchi and then transfer to the prepared baking dish. Sprinkle with the remaining mozzarella and parmesan and bake for 40 minutes until golden and bubbly. Full of pumpkin AND cheesiness?! YES please. I just made homemade gnocchi the other day with a white cream sauce, so now I’m doing the homemade gnocchi again but with this delish pumpkin combo!! These were amazing! My family loved everything about it! Thank you very much for your recipe. I made the dish for my husband this afternoon for lunch. He was so happy and he absolutely loved it. He told me this dish was out of the ballpark! It will now be a regular on the menu for him. Once again much thanks! Oh Shirley, I am happy to hear this. Thank you so much for coming back to comment. This looks like a wonderful meal. Your pictures are making my mouth water and I want these for breakfast (its still early here).